Super Hero Boy: Anyone want a puppy for Christmas? Anyone want a puppy for Christmas? The buddies are back for Christmas and are still tugging on hearts everywhere as when they said there is no cuter puppy than a golden retriever puppy, they really were not joking. Following in the footsteps of Air Bud and Space Buddies, Santa Buddies adds to the line's long lived success.Unlike so many of the Disney movies we review the Santa Buddies are living breathing puppies which Connor finds fascinating. I'm fairly sure now Connor is convinced that Melos and Boo (our Chihuahuas) can talk and they have been holding out on him all this time. The Santa Buddies story is kinda familiar. It reminds me the story of Scrooge and the Christmas Carol as even the little orphan puppy looking for a home is named Tiny. Though with Santa mixed in it's sort of its own original twist to the story, not to mention the dogs! It's a super cute story and by far my favorite thus far of the "Buddies" movies. Something about puppies and Christmas just go together no matter who you are. 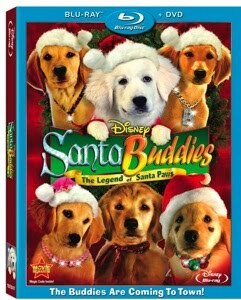 Disney released Santa Buddies in as always my all time favorite format a blu-ray and dvd combo pack. For those of you that have not previously heard my ranting and ravings on this regardless if you own a blu-ray player yet, though after the great sales available over the last week on them shame on you if you don't, you cannot loose by buying the dvd & blu-ray combos. We keep our blu-ray copy at home in the entertainment center and our standard dvd copy goes with us on car trips or kept in Connor's room for bedtime viewings. Either way it's like getting two copies of the movie for the same price as one. If you're pre-blu-ray player then your all set for when you do upgrade and for those of us that have one its just an extra bonus. I've not yet watched the standard version but the blu-ray version is fabulous. The sound is crisp and the special effects are actually really great for a direct to dvd film. The extras are limited compared to some of the more big budget Disney films but there is a sing along and music video included on both versions. Overall its a super cute Christmas film that will be a great edition to your video library! I grew up in a generation where Christmas specials and movies were just a way of life on Christmas break! It seems like you see less and less of them these days so its really cool to see a new one that we really enjoy! You can pick up your own copy of Santa Buddies right now on Amazon! I have two copies of Santa Buddies to give away to my readers. The grand prize winner will win a copy of Santa Buddies plus a really cool Tiny plush doll and the second winner will win a copy of Santa Buddies. Leave a comment on this post. Just check out Santa Buddies and tell us which Disney movies you have on your holiday wish list or what your favorite Christmas movie is! My favorite Christmas movie is White Christmas! I've always enjoyed Miracle on 34th street. My favorite is It's a Wonderful Life. Thanks so much. We have the Princess and the Frog on our Holiday wish list along with the new Ice Age movie. My favorite Christmas movie is White Christmas. We have the Princess and the Frog and Tinker Bell on our Holiday wish list! I love It's A Wonderful Life. I am a subscriber via RSS Feeds. My favorite Christmas movie is A Christmas Story. I watch it at least twice every year. ITS A WONDERFUL LIFE IS MY FAVORITE!! My favorite Christmas movie has always been It's A Wonderful Life. Please enter me. Thanks! We love to watch Christmas Vacation and Jingle All The Way. My grandkids want G-Force and the Tinkerbell movie for Christmas. One of our favorite Christmas movies is "A Christmas Story". We watch it..and laugh...every year. Thanks for the review and giveaway! My favorite Christmas movie is A Christmas Story!! We enjoy watching a Miracle on 34th St. I love Rudolph, I cry every year when I watch it! My favorite Christmas movie is "A Christmas Story." And I am an email subscriber! Home Alone is my favorite Christmas movie! And 101 Dalmatians is my favorite DIsney movie. My favorite Christmas movie is The Little Drummer Boy. We love the movie Elf! My favorite Christmas movie is the cartoon Grinch who stole Christmas! My favorite Christmas movie is The Polar Express. Our fave movie is A Christmas Story...Makes us laugh each time. Thanks for the chance. My favorite Christmas movie is Miracle on 34th St. or A Christmas in Connecticut. I like both versions of Miracle on 34th Street. eh it's disney, i'd give it a spin. My favorite Christmas movie is The Muppets Christmas Carol. How the Grinch Stole Christmas is my favorite Christmas movie-I love it! My favorite Christmas movie is A Christmas Story! Little Drummer Boy is my favorite! My favorite is it's a wonderful life. the favorite christmas movie in this house is national lampoon's christmas vacation! Tinkerbell and the Lost Treasure is a sure-thing on my shopping list this Christmas! It's A Wonderful Life is our favorite. My favorite Christmas movie is the Grinch! Our favorite Christmas Movie is Jingle all the way...we have so much fun watching it every year! I want to get Up and the new Tinker Bell. Please accept my entry. Thank you. The Disney movie "Up" is on my wish list. My daughter and I both loved this movie so much. Thanks for this giveaway. Disney / Pixar's "Up" is definitely on my holiday wish list. Thank you for the chance to win. Happy holidays. My children love these dogs, so this is definitely on our list. So is UP, which we didn't get a chance to see in the theater. My all-time favorite Christmas movie is It's a Wonderful Life! My favorite is "It's a Wonderful Life" & my wish list movie is "Santa Buddies". Our fave holiday movies are The Polar Express & Elf. Disney's UP! is on our Christmas list. My favorite Christmas movie is White Christmas. Thanks for the giveaway. My favorite Christmas movie has always been Santa Claus is Coming to Town. My favorite Christmas movie is A CHRISTMAS STORY, and the movie on my wish list this holiday season is SANTA BUDDIES. Thanks! Snow White is on my wish list. My favorite Christmas movie is Elf. He was soooooo cute in that role! My favorite is "The Christmas Story". My favorite holiday film is "It's A Wonderful Life"! Disney/Pixar's "Up" is on my Christmas wish list. Thank you for the chance to win. Happy holidays. We have Santa Buddies and The Princess and the Frog. Love the "Christmas Story" film, otherwise known in our family as "the BB gun movie" with little Ralphie! My dh and I relate because it's set in the '50s when we were both growing up! My favorite holiday movie is Elf. I really like Christmas Vacation, too. I love National Lampoon's Christmas, thanks! It's all about Bad Santa around here. Rudolph is my favorite Christmas movie! Thanks! My daughter loves the Buddies! We have Santa Buddies and GForce on the list. My favorite Christmas movies are A Christmas Story and Polar Express! The Disney Movie I want for Christmas is Snow White. My fave Christmas movie is Elf! I love the movie elf! My favorite Christmas movie is It's A Wonderful Life ! UP! is on my son's christmas list! santa buddies is on our list! My daughter has Santa Buddies and UP on her wish list. My favorite Christmas movie is Polar Express, I love that movie! Thank you for the great giveaway and HAPPY HOLIDAYS!! My favorite holiday movie is-- The Homecoming: A Christmas Story. I subscribe in Google Reader. Thanks!